Jose Elmer “OJ” Porteria is the name of the fresh-faced Fil-American teenager who at the tender age of 17 has already earned his place among the Azkals. 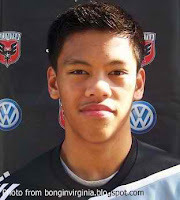 Discovered during tryouts held in the United States by senior team members, Porteria was born to Filipino parents and played football – or soccer, as the game is preferentially called in that side of the Pacific – for Falls Church high school, the United States Soccer Development Academy and the academy team of Major League Soccer franchise D.C. United. Azkal fandom first got a first real look at Porteria during the country’s less than convincing performance at the 2011 Southeast Asian Games held in Jakarta. Hastily assembled and short of authentic defenders, the Under-23 team eked out a sensational win over Laos courtesy of a late Joshua Beloya brace but lost all its other matches. The team was, admittedly, young and being prepared for the future. Porteria, a mere 16-year old at the time, personified the football saying that if you are good enough, then you are old enough. The paradox here – and for every young player – is that there cannot be any takeoff unless the feet are firmly planted on the ground. It has been hard work and passion that brought Porteria to where he is in his young life; and will also bring him so much more as the future of Philippine football continued to unfold before our eyes. Indeed, the teenager was this little bundle of energy who played with the fizz of youth. Comfortable in possession and not afraid to get stuck in against obviously older – not to mention bigger – opponents, Porteria looked every bit an excellent prospect for the future. In the losing effort against Timor Leste, Porteria timed his run perfectly and arrived late at the far post to tuck in a low cross for his first goal in a Philippine jersey. In the same match, he also cleared a goal-bound effort from off the line after Roland Müller went for a ball and was caught stranded. In the team’s only victory of the tournament, Porteria unlocked the Laotian defence with a sublime ball that found Mark Hartmann running into space inside the box. The latter squared the ball for Beloya to tap in the equaliser after Laos had erstwhile been cruising. The team returned to Manila having fallen well short of expectations; albeit management was quick to acknowledge the shortness of the preparations and vowed to rectify this for the next games in two years’ time. Fortunately, the senior team had a glamour friendly against the LA Galaxy lined up along with the Challenge Cup to look forward to. The SEA Games debacle was soon forgotten, although some of the team’s members continued to be involved with the youth set up. Almost a year after Jakarta, with the Challenge Cup third place trophy already won and eyes firmly set on the 2012 edition of the Suzuki Cup, the senior team was to embark on a whirlwind three-nation tour of Southeast Asia. When the touring party was announced by the Philippine Football Federation, probably the most eye-catching name in the line-up was Porteria’s. It was not as though there were no other youth players to take along to make the numbers; and, indeed, the names Beloya, Valmayor and Porteria’s namesake Clariño came to mind. For Porteria to make the party instead of his older SEA Games teammates could only have meant that he must have been excelling in training sessions to earn the nod from the coaching staff. This was a massive step up for the teenager. There was far too much quality and experience in the team for Porteria to become anything but a fringe player during the tour. However, to be called up at such a young age spoke volumes about how highly-regarded the youngster must have been by team management. The situation was not dissimilar to Roy Hodgson calling up Liverpool’s own prodigious 17-year old Raheem Sterling to the England camp recently. While Sterling did not get the chance to play, Porteria did better than his fellow teenager by getting a cameo in Phnom Penh. When Michael Weiss sent in Porteria for Paul Mulders in the 82nd minute against Cambodia, the Filipino teenager was making his senior Azkals debut. There was more to come, however, in the Peace Cup that the Philippines subsequently won. Porteria came on for Chieffy Caligdong with just 20 minutes remaining of the opening day match against Guam. He played five minutes longer in the next game against Macau and even set up a goal for Patrick Reichelt. Collecting a short corner on the right flank, Porteria wove inside past two Macau defenders before cutting the ball back for Reichelt to score. Even that little pull back when Macau were already well-beaten gave a glimpse of Porteria’s maturity beyond his years. Many players his age – and just as many even older – in that exact same situation would have gone for glory. Because veteran Ian Araneta misfired badly in the Philippines’ first two matches in the Peace Cup, Porteria was given his first senior start in the final match against Chinese-Taipei. Although the Philippines sat top of the table going into the final, starting with the teenage protégé was still something of a gamble because the team could still lose the title and Chinese-Taipei were always going to be a different proposition compared to either Guam or Macau. Porteria repaid the coaching staff by not only giving a vibrant display and giving the Philippines pace up-front; he also capped his first senior start with a fine goal in the 43rd minute. Reacting quickly to intercept an errant pass, the teenager sprinted forward and coolly slipped the ball under the diving goalkeeper despite the desperate lunge of a Chinese-Taipei defender. It was a goal that Michael Owen, in his prime, would have been proud of; albeit, it is another Liverpool prodigy of a much earlier era that Porteria ultimately reminds me of: the great Kevin Keegan, just an inch taller than Porteria and somebody who played with the same fearlessness and zest despite his diminutive size. It is fine that Porteria, before the Chinese-Taipei game, had been used primarily out wide. That was for his own protection and development, since on the flanks he did not have to worry about what was behind him. I feel, however, that all that bubbly energy and pace – not to mention a nose for goals – are best used playing off a big striker, just like Keegan simply flourished in his partnership with the tall Welshman John Toshack. It will probably take a few more years before Porteria becomes a regular first-choice player for the Philippines; and the coaching staff will be better served not to give him too much too soon. The paradox here – and for every young player – is that there cannot be any takeoff unless the feet are firmly planted on the ground. It has been hard work and passion that brought Porteria to where he is in his young life; and will also bring him so much more as the future of Philippine football continues to unfold before our eyes.